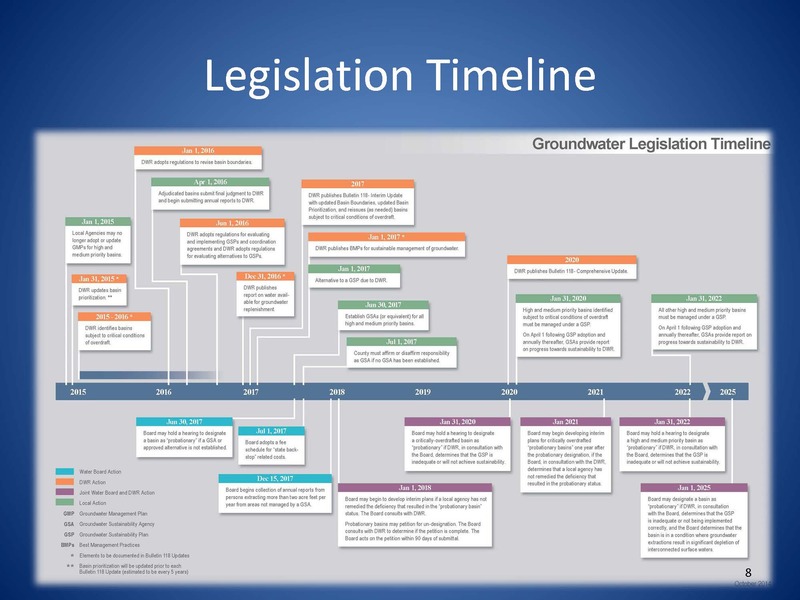 With the passage of the Sustainable Groundwater Management Act in the fall of last year, the Department of Water Resources and the State Water Board have been busy working on tasks related to implementation of the legislation. 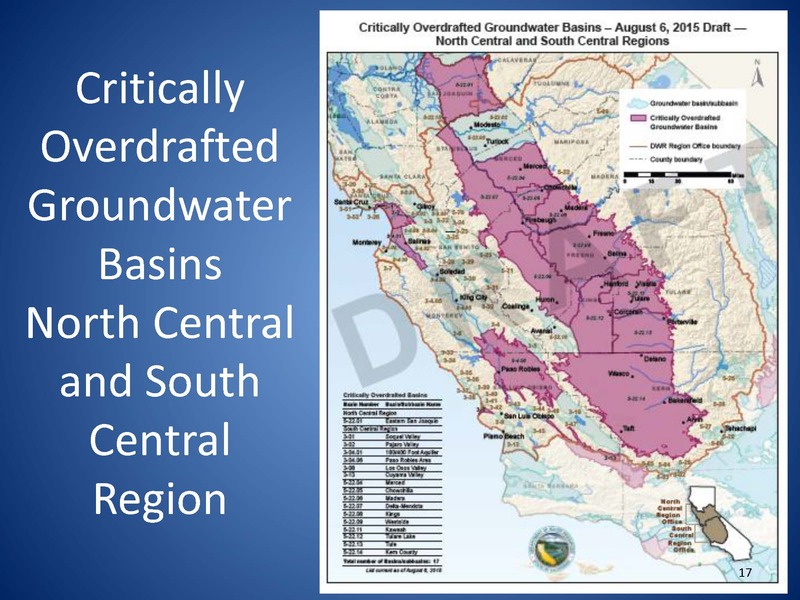 Recently, staff from both DWR and the State Water Board held a public meeting in Sacramento to present what actions they are taking to implement the Sustainable Groundwater Management Act. In 2003, Bulletin 118 was published, which is the Department’s report on groundwater basins; it is the basis of a lot of the technical information that was used to support the SGMA legislation, he said. The CASGEM program was rolled out in 2009 which set requirements for statewide groundwater elevation monitoring and required local agencies to submit groundwater elevation data to the state. The Governor came out with the California Water Action Plan in 2014 which identified a number of different activities the state could promote to support sustainable management, and groundwater was a big part of that, he said. 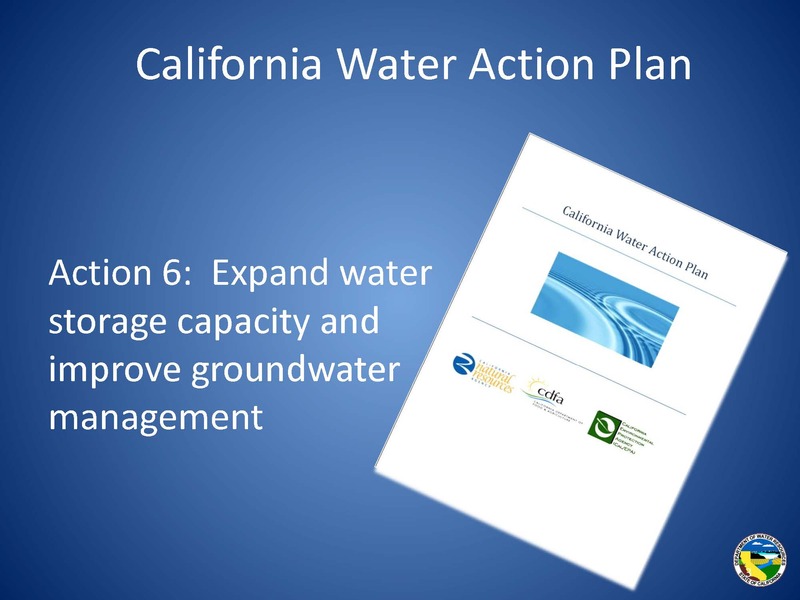 Action 6 is related to expanding water storage, both surface water and groundwater, and improving groundwater management. He noted that the California Water Action Plan had ten different categories of actions; those all made it in one way or another into Prop 1 to provide funding to support these different actions, he said. 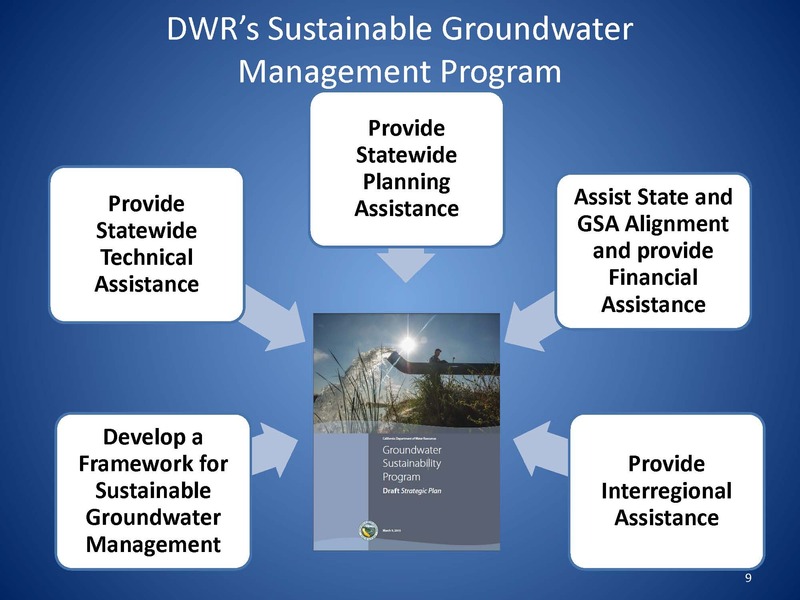 In 2014, the Sustainable Groundwater Management Act (SGMA) was passed, setting the sustainability goal for groundwater management and promoting local control over groundwater management. 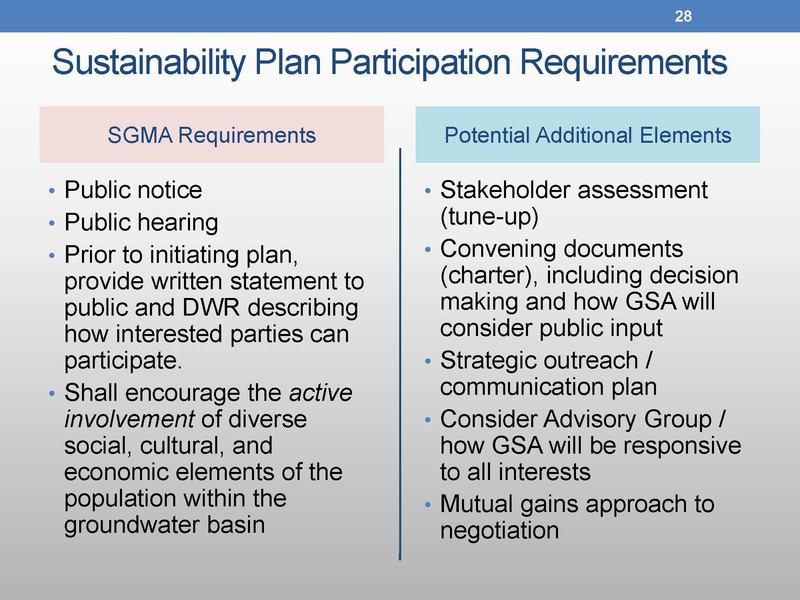 Develop groundwater sustainability plans: SGMA requires GSAs to develop groundwater sustainability plans. Mr. Juricich noted that the legislation states that Groundwater Sustainability Plans themselves are not subject to the California Environmental Quality Act (CEQA), but any projects that might be implemented through those plans may be subject to CEQA. The goal is to establish sustainable groundwater management of those basins over time, and it gives a 20 year period to accomplish that, he said. He then presented a timeline for implementation of SGMA for the next 20 years. He noted that the orange boxes are the ones that the Department is front-loaded to provide with respect to implementation. 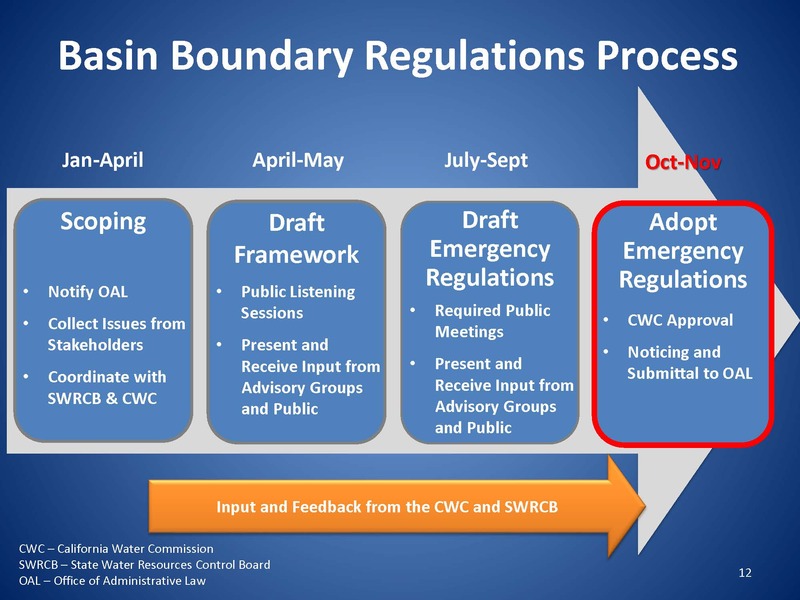 These actions include writing regulations for basin boundary revisions which will be finalized by January 1st, 2016, with the regulations for Groundwater Sustainability Plans following in June of 2016. 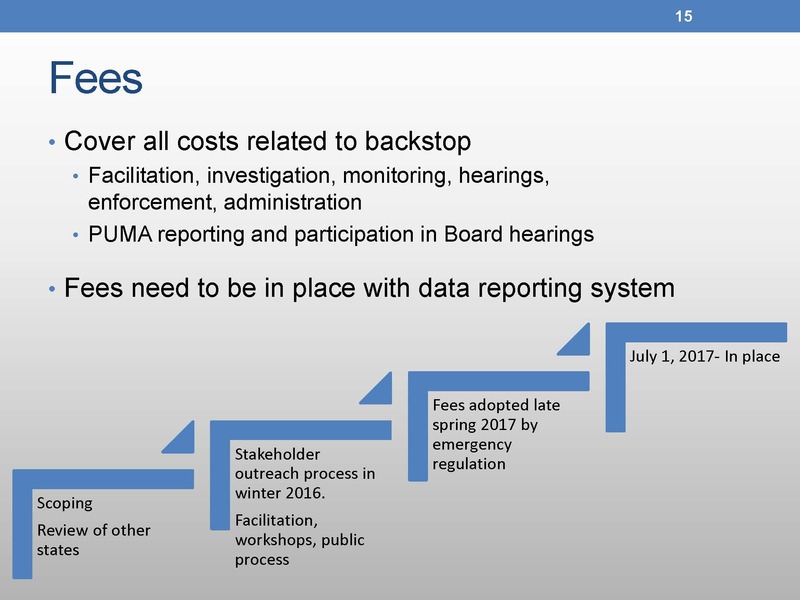 The purple boxes on the timeline represent actions that the Department of Water Resources and the State Water Board will be working together for implementation, so is a lot in the legislation that basically requires consultation between our two agencies. 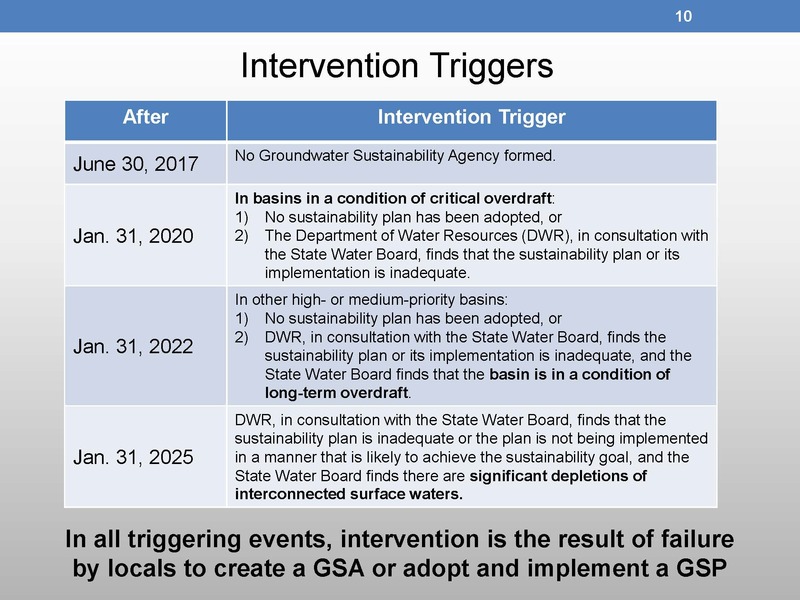 One of the first steps the Department of Water Resources took after the SGMA legislation passed is they developed a strategic plan to help guide their activities. “There’s a number of other things that we’re trying to do to support this because the goal is sustainable management of the basins by the local agencies, and so we’re looking at our different programs to see how we can better fit those to support that local groundwater management,” he said. With respect to providing technical and planning assistance to local agencies, Mr. Juricich noted that the California Water Plan which gives a high level overview of the state’s water resources and water budgets will be improved to better support SGMA, he said. The Department is also updating Bulletin 118 to make that as useful as possible to local agencies that are implementing SGMA. The Department is providing facilitation support services for areas needing assistance in doing stakeholder assessments and holding meetings, he said. Click to read the strategic plan. “Statewide we’re not going to achieve sustainable management just by looking at each basin individually, so there is a connection between those basins and a connection with the state and federal projects, so we’re looking at things we can do to help support that interregional connection,” he said. Mr. Juricich noted that all these elements of the Department’s plans and programs are described further in the strategic plan. He presented a list of near-term activities, noting that a number of them have already been completed or are close to completion. The initial basin prioritization has been completed; those will be updated later on as part of the regular update; it will also include any information on potential basin boundary revisions that are received. In August, the Department issued a draft list of basins in critical conditions of overdraft which is due to be finalized shortly. 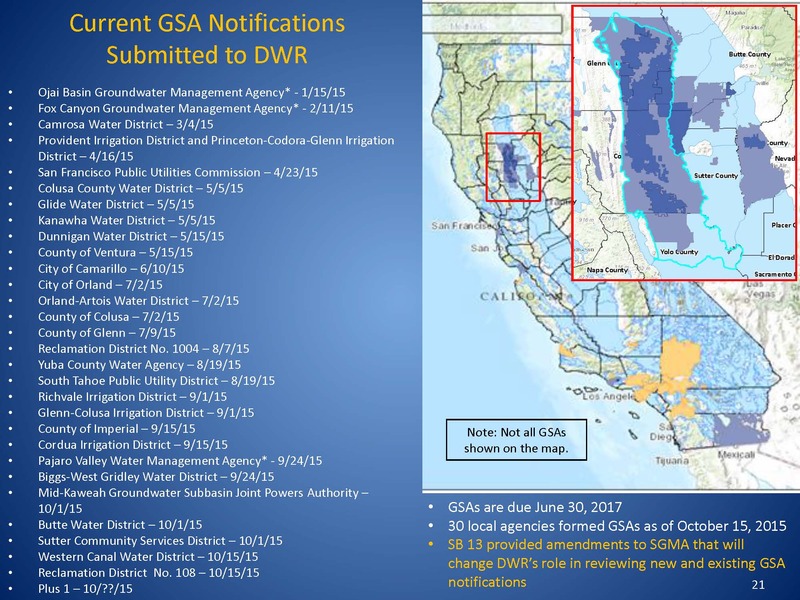 Just recently, the final regulations for the basin boundary revision process were adopted by the California Water Commission and are expected to go into effect beginning January 1st of next year. 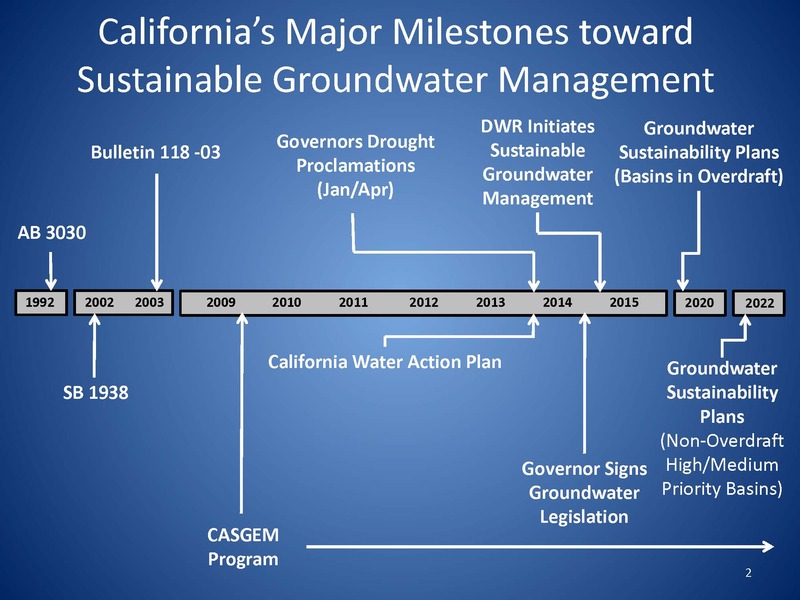 The regulations for groundwater sustainability plans and alternatives to a groundwater sustainability plan are currently being developed and are expected to be completed in June of 2016. As a requirement of the legislation, the Department is working on a report to provide estimates of water available for groundwater replenishment, he noted. 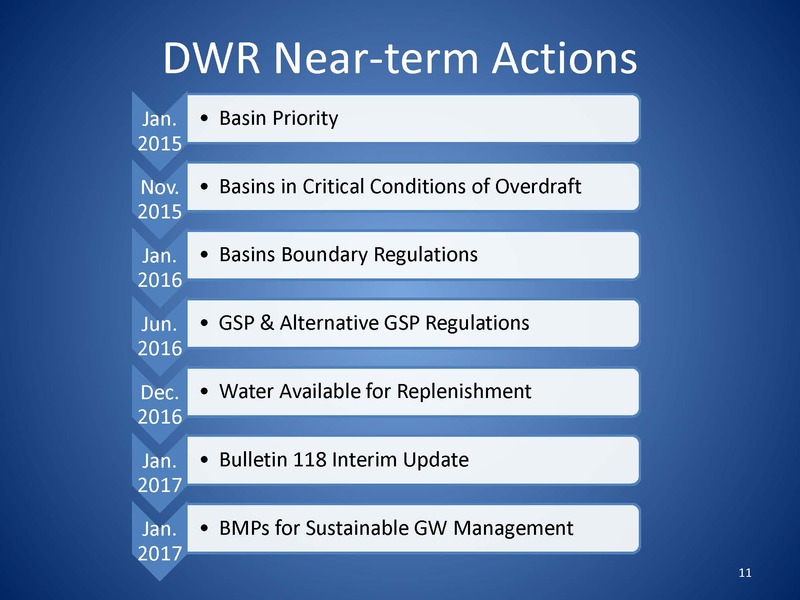 The Department will issue an interim update to Bulletin 118 in 2017 that will include any basin boundary revisions and the list of basins in critical conditions of overdraft; that will be followed up with a more formal update in 2020. The final task for the Department is to develop best management practices for sustainable groundwater. “The idea there is to take some of the information that will be required in the regulations, but then highlight what are some best management practices, and maybe some case studies of where areas are doing this activity,” he said. 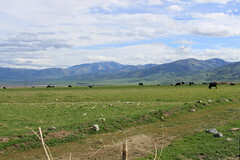 The basin boundary revision regulations were completed in four phases. In the first phase, Department staff went out and listened to what people were thinking about different issues related to basin boundaries. A draft framework was developed along with issue papers around topics of concern, and those were discussed with the different advisory groups and presented a public meetings. During the summer, the text of regulations was drafted; that went through additional outreach and public meetings. 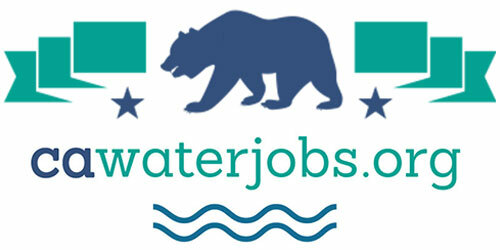 The final phase was adopting the regulation, which happened at the October meeting of the California Water Commission. The next two sets of regulations the Department is developing are for the groundwater sustainability plans and the alternative to the plans. The goal is to have these adopted by June of 2016. 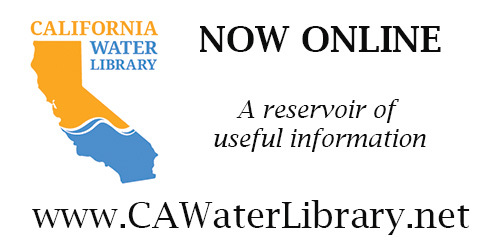 There will be periodic updates at the California Water Commission as well as public meetings throughout the process. 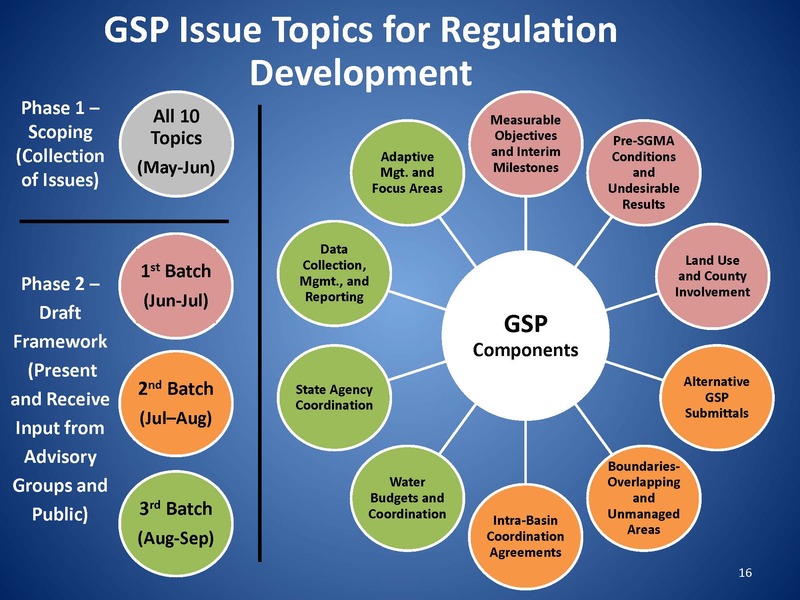 The Department divided up the topics into ten areas, such as measurable objectives, defining pre-SGMA conditions or baselines, undesirable results, water budgets, state agency coordination, and others. The Department put out issue papers which detailed what the water code said and described the issues heard so far, and held scoping meetings to discuss the topics. The next task the Department has completed was drafting a list of basins in critical condition of overdraft. He presented a map showing the critically overdrafted basins in purple. The starting point for the list was a list developed in 1980 that had identified 11 basins; they then looked at existing information and reports to identify other basins with significant issues such as declining groundwater levels, sea water intrusion, and subsidence, and those basins were added to the list. 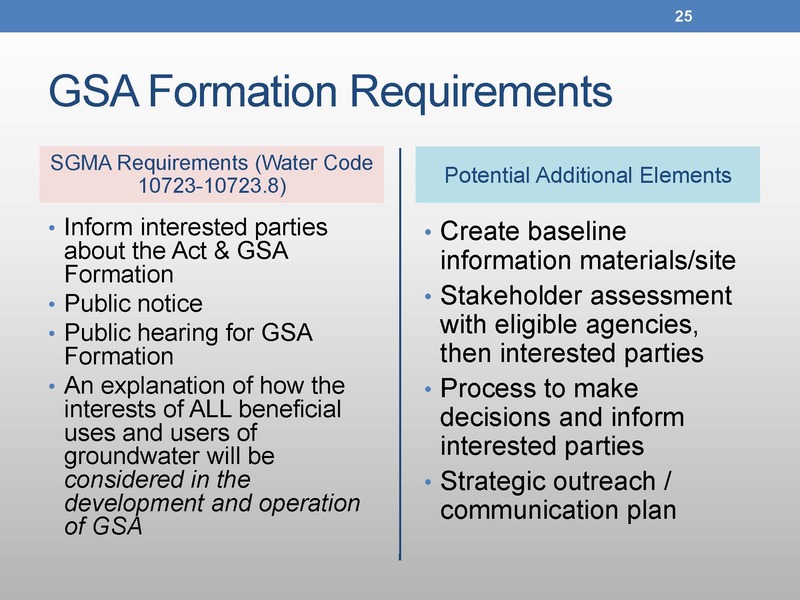 SB 13 also allows participation of mutual water companies and water corporations in the GSA; they cannot be a stand-alone GSA but they can participate with other public agencies in the GSA. SB 13 also clarifies that an agency forming a GSA has to stay within its own service area. Erik Ekdahl, Groundwater Management Program Manager for the State Water Board’s Office of Research, Planning, and Performance then discussed the role of the State Water Board, delving into the intervention process, and highlighting the other requirements and duties of the State Water Board under the new SGMA legislation. But first, he went through a few basics of the Sustainable Groundwater Management Act (SGMA). 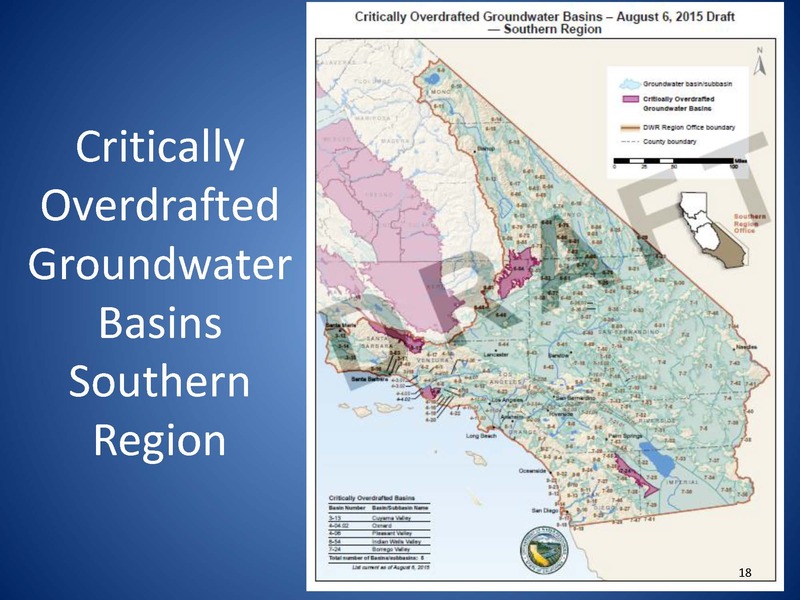 SGMA requires the formation of a Groundwater Sustainability Agency and the development of subsequent groundwater sustainability plans in 127 high and medium priority basins. 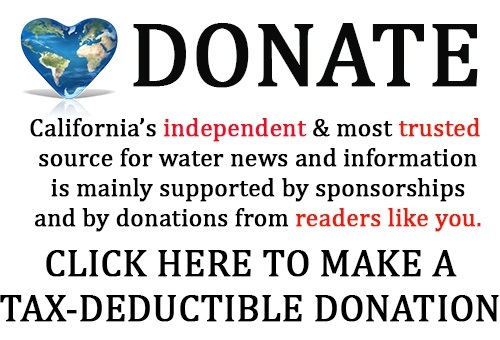 “That’s 127 out of 515 total in the state of California; however, those 127 account for 90 – 95% of all groundwater used in the state,” he noted. SGMA authorizes new management tools for local agencies to directly manage their groundwater resources, such as fee authorities, limitations on groundwater extraction, monitoring requirements, limitations on well spacing, and a number of others. It defines a time frame for accomplishing goals – generally 20 years after the development of the sustainability plan, and creates a backstop or a state intervention process. 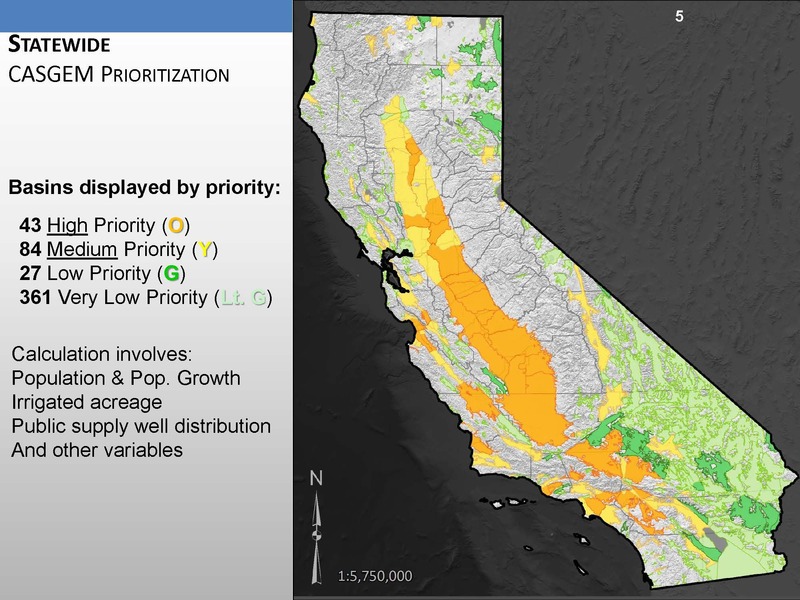 He presented a map of the groundwater basin prioritization, noting that there are 43 high priority basins and 84 medium priority basins which includes much of the Central Valley, the Central Coast region, and much of Southern California. 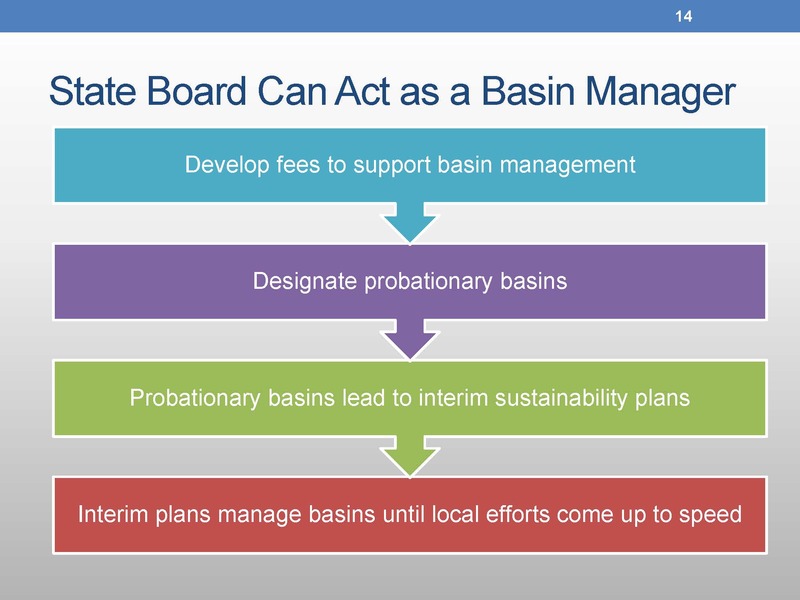 He also noted that many of the basins in Southern California are adjudicated and SGMA does not apply to those adjudicated basins, though there are still are some reporting requirements. SGMA requires local agencies develop a Groundwater Sustainability Agency by June 30, 2017. “A GSA can be comprised of one or more local public agencies; however, if it is more than one, then they have to coordinate and work out how that coordination will occur, particularly if there’s more than one GSA per basin,” he said. Mr. Ekdahl noted that while SGMA defines sustainability, the legislation did not define ‘significant and unreasonable.’ “In most respects and in most likelihood, this is going to be a locally-derived definition; the locals are going to be responsible for defining what is significant and unreasonable to them,” he said. June 30th, 2017: The State Board can intervene if a local agency or a group of local agencies fails to form a Groundwater Sustainability Agency. “Some of the triggers are directly related to implementation of the backstop, so we’re working with the Department and figuring out how that’s going to work and what ‘in consultation’ means as we go forward into 2020 and 2022,” he said. 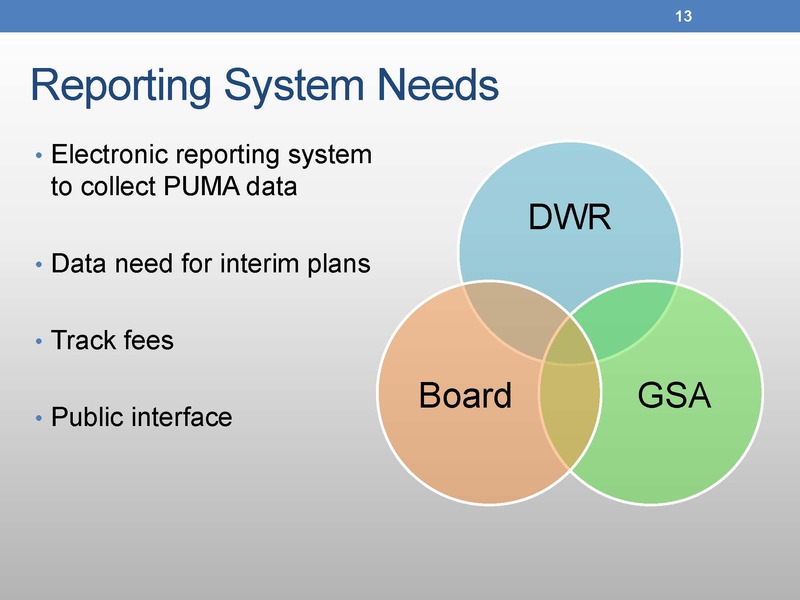 The reporting system will need to be electronic and be able to interface with the Board’s needs, the needs of the Department of Water Resources, and the local agencies who are responsible for developing a GSA. If the PUMA is large, there could potentially be tens of thousands of wells so it’s going to have to be an electronic self-reporting system, he said. There will be fees associated with anything that is reported to the Board, in part to help recuperate costs associated with the intervention process, he said. “The board is specifically required to recover costs associated with state intervention,” he noted. “Fees are required to cover all costs and need to be in place by about 2017 associated when we might get our first unmanaged area,” he noted. Mr. Ekdahl acknowledged that there are a number of local challenges to SGMA implementation, such as a rush to fragmentation, overlapping governance, startup costs and funding challenges, and coordination with neighboring GSAs. There are coordination requirements within a basin, he said. 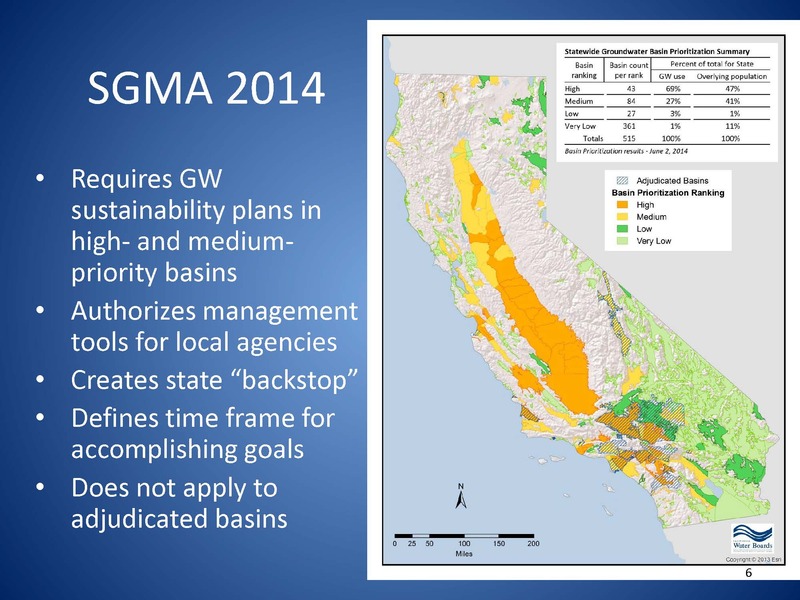 SGMA requires that basins with multiple sustainability plans coordinate with other agencies preparing plans in that same basin. They have to coordinate in terms of key pieces of information, including groundwater elevation, extraction, surface supply, total water use, change in storage, water budget, and sustainable yield, he said. Lack of coordination will be an indication of inadequacy and will result in Board intervention. Interested parties as defined by the legislation includes all groundwater users, tribes, counties, planning departments, disadvantaged communities, federal government, environmental users, and surface water users, amongst others. “I’ll leave you with this parting thought. Groundwater was once out of sight, out of mind. SGMA is going to open new doors but we might not know what we find behind those doors,” he said. A question is asked related to GSA notifications to the Department and the new completeness review they are required to do. For those existing areas that have already submitted, could those requirements require them to go back and re-submit? A three-part question: Do coalitions created under the Irrigated Lands Regulatory Program count as a local public agency? 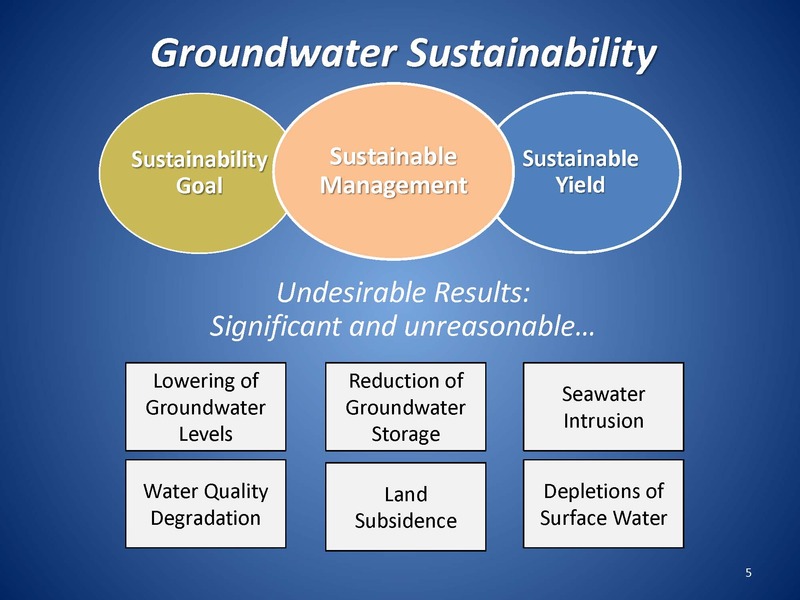 Will SGMA take into account groundwater quality management plans created under the IRLP? 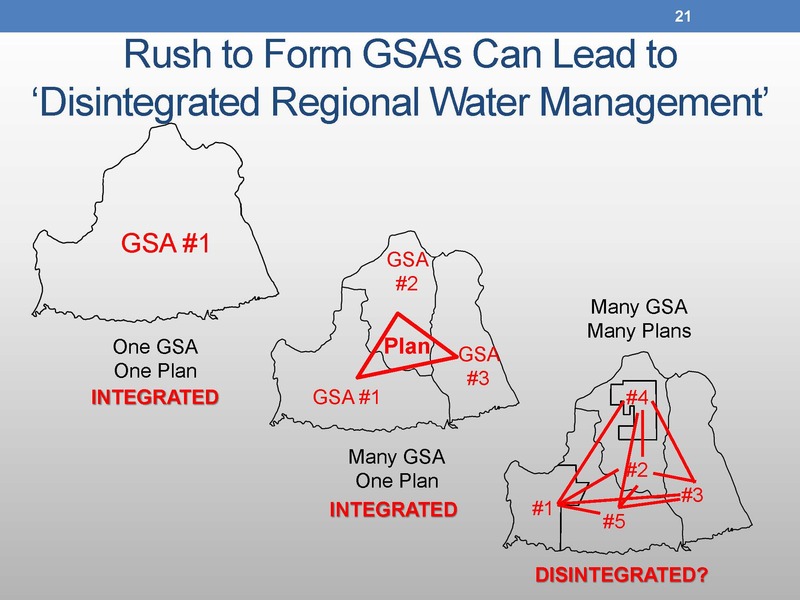 And how does SGMA and the integrated regional water management program relate to each other? Question: What is going to happen when different agencies submit their notice of intent to become a GSA, and the GSA has overlapping portions with another GSA. Will DWR be throwing out these notifications entirely until they resubmit without overlap? Question about multiple GSAs and multiple plans … In that situation, the plans don’t necessarily agree within an overall basin, is that then an opening for state intervention? Is that where that is going? Question: You mentioned that local agencies are going to have a lot of leeway in defining undesirable results. To what degree is the State Board and DWR going to play a role in ensuring that those definitions adopted are enforceable, measurable, and have substance?